Tesoro Restaurant at 18 Schoolhouse Ln. just south of 2nd St. and off Hurontario St. in downtown Collingwood. Tesoro features an Italian menu including pasta, salads, fresh seafood and gourmet thin crust pizza. Wheat-free/gluten free pasta and soy mozzarella are also available. Tesoro also caters private functions from parties of 10 to 100. 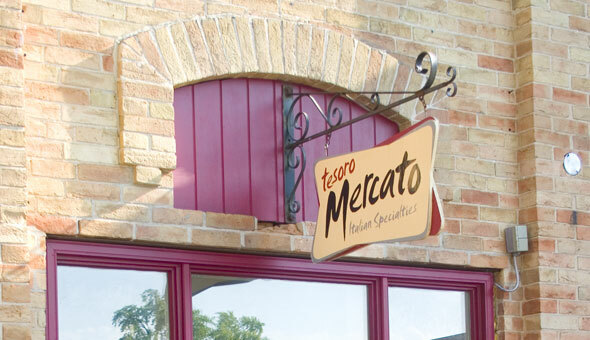 Afterwards, consider picking-up some home-made entrees at Tesoro Mercato or some desserts at Avalanche Homemade Gelato, both sharing the same space as the restaurant. Note: Tesoro is usually closed Sunday, unless a Holiday weekend.